Hello Everyone! One of my followers on Facebook, Luciano, had requested that I make my Risotto Alla Piemontese recipe. Below you will find my recipe for the risotto and for pork cutlets as well. My video is also found below in case any of you prefer to watch my recipe for visuals. The recipe only takes about 45 minutes in total, which makes this recipe great for a midweek dinner with the family or a weekend lunch with friends. I hope you like it and please enjoy! Starting with the risotto, add the garlic, olive oil, onion, and butter in a medium sized pot. Place the pot on the stove over medium/high heat. Using a wooden spoon, mix for about 3 minutes until the butter is melted and then add the cup of rice. Keep turning the rice using the wooden spoon for about two minutes so that it does not burn. This will ensure all rice is covered with the butter/onion mixture for better cooking and taste. 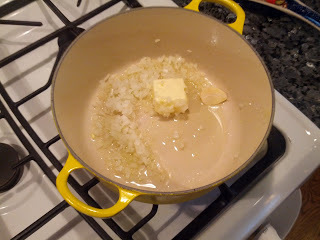 Remove the clove of garlic from the mixture. Add about one cup of white wine to the mixture. Stir occasionally until the wine is absorbed by the rice. Add about two cups of chicken broth to the pot. Cook on medium heat for a slow boil until rice absorbs the chicken broth. While the risotto is cooking, prep the pork cutlets. Add olive oil to a frying pan, enough to cover the bottom of the pan, and one to two garlic cloves for taste and place on stove over medium/high heat. Place two whole eggs in a bowl and add salt and pepper and mix/scramble. 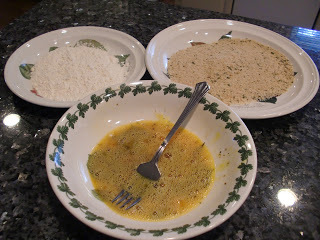 Add a small amount of flour onto a dish, enough to cover both sides of each pork cutlet. 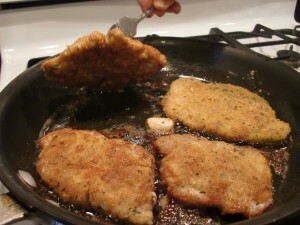 Also, add a small of breadcrumbs to a dish, enough to cover both sides of each pork cutlet. 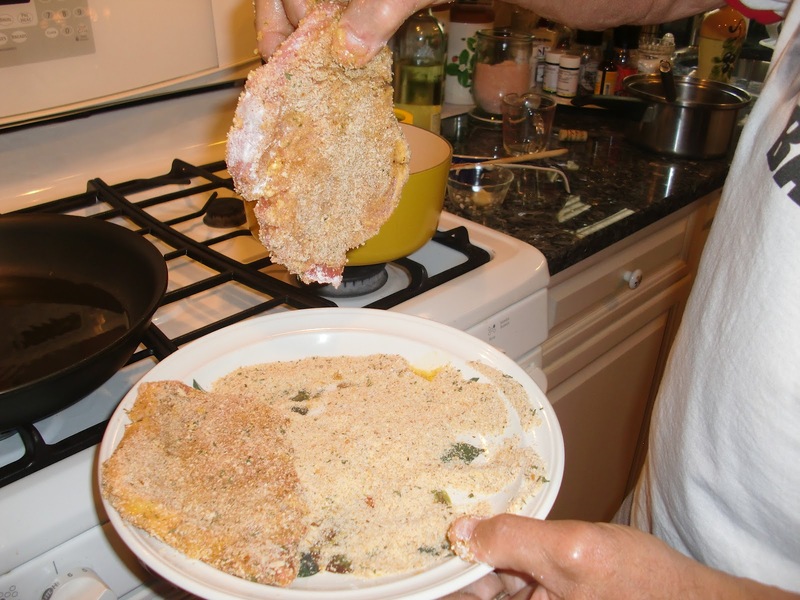 Cover both sides of each pork cutlet with flour, then dip both sides in egg mixture, and lastly cover both sides with breadcrumbs. 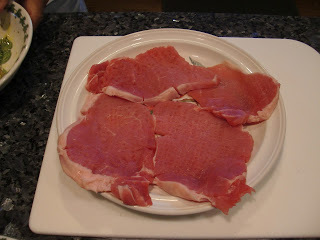 Place each pork cutlet into the frying pan and cook each side for about 5 – 7 minutes or until golden brown. While the pork cutlets are cooking, gently clean off any sand or dirt off the surface of the mushrooms by using a wet paper towel. 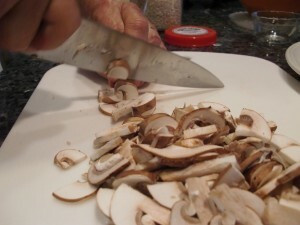 Then cut each mushroom in half and then thinly slice each half of the mushrooms. Check the risotto. If the rice is still hard once chicken broth is absorbed, add another 1/2 to 1 cup of broth to the rice. Add the mushrooms to the risotto when the majority of the broth is absorbed or about 5-10 minutes before it is done cooking. 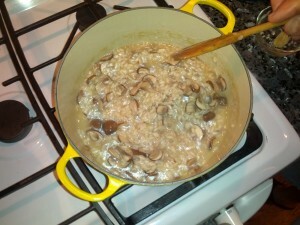 Once the risotto is cooked, add 1/2 Tbsp. of butter and 1/4 cup of parmigiano cheese. Add a dash of black pepper and turn the flame off. 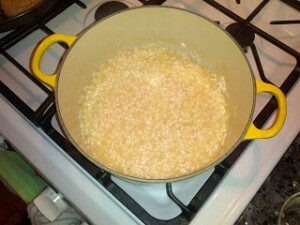 Let the risotto sit on the stove for a few minutes to achieve the desired texture. Serve with pork cutlets and add a few basil leaves on top of the risotto for extra taste. Using homemade chicken broth gives the risotto a better taste. Add salt to risotto as desired. The chicken broth should already have sufficient amount of salt for taste and no salt may be needed. Switch out the portobello mushrooms for truffles.